Bigger. Better looking. More gear. Feel the power under the hood. A full 64-bit engine makes the most of your computer memory and resources, and now there's no barrier to your creative dreams. More instruments, more effects and higher performance all add up to more music making power, in whatever style you choose. Rock-solid reliability and power mean that you can focus on making music without any interruptions. No bugs, no crashes, just you and your music. This is what music production is all about! Apply effects, add tracks and instruments, edit audio, change the pitch and tempo – and do it all in real time. It looks as good as it sounds. 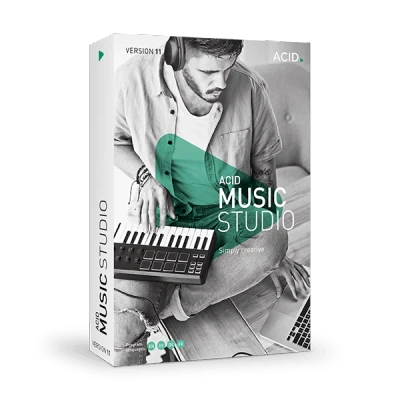 We have updated the ACID Music Studio experience with a brand new, slick interface which will inspire you to make even better music. 8 New Instruments. 6 New Effects. Ready for the next level. Now you can really take your music in any direction you want with a suite of new instruments and effects. Try out a vintage amp, brand-new synths, or an electric piano. There are no limits to your music making. An outstanding analog compressor featuring a Vintage mode, which adds character and punch to your sound. Take a trip through your brand new loop collection. Whatever you produce – hip hop, house, electro, pop or rock – you'll find many inspiring loops to take your music to the next level.